Because it’s damn cold out there, and because it’s always nice to have the same number of fingers at the end of the season as you did at the beginning, we present the best gloves for guys. No longer the exclusive domain of smokers and vagabonds, the fingerless glove is perfect for dexterity-loving dudes. Made with wool and Thinsulate, this pair’s magnetic flip closure works way better than the typical Velcro. $32. 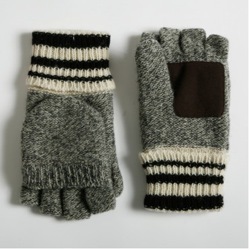 You’ll get excellent deerskin/cashmere gloves from Shawcross of Winnipeg – http://www.shawcrossbros.com – for much less than $415! I’ve been buying from them for 20 years (though they wear so well, that doesn’t represent much business for the Shawcrosses. Thanks for the tip, Jeff. Definitely some nice looking gloves!